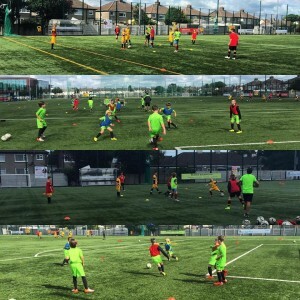 Our Catalan Professional coach Marc Miquel writes about his experiences so far in Ireland in his words. After four months coaching in Dublin I’ve noticed many differences beetwen Football in the Catalan region and the football that is practiced here in Ireland. I can say that there’s a lot of work to do, its going to be a challenging process in order to reach the targets in which we have set for ourselves. Our main focus is to change the mentality of Irish people and players both on and off the pitch. We want them to consider said that this process possible for us to develop more intelligent players. Our main focus in Spanish and Catalan football is to develop the cognitive qualities of the players, to use the brain in the game. In Ireland from my experience so far, players think about the game a lot less than that of Catalan players. Maybe one of the reasons is the fact that they do not have a professional league with professional players on their doorstep to watch on a weekly basis. For this reason I have found that players need continuous reminding of the concept of training. We hope that we can make a small difference towards this, like our Academy Director says “every process starts with a little change.” This process will acquire diferent methods to make the things, develop the qualities that the smartest players have (based around tactical elements) or start to produce different players. Our focus in Catalan Elite Football is to develop tactical qualities of the players as individuals. The company’s founder, Colm Barron, studied the different football methodologies around Europe and specifically in Futbol Salou and the Tecnifutbol Academy. After meeting with Albert Vinas and studying the smartfootball methodology he decided with the support of Albert to reproduce the methodology in Ireland in the Catalan academy. In one of the last travels he visited Complex Esportiu Futbol Salou where I was working and spoke to both Albert Viñas (Complex boss) and Colm, they decided to give me the chance to help the academy to introduce the Catalan methodology. Our work started there…. I’m gonna talk about the general level which we could see in our academy, in different pitches around Dublin and clubs where Catalan Elite Football started to work in (Knocklyon United, St. James Athletic and Park Celtic). Like I mentioned above the players do not recognise the training as a training, it is more like going to enjoy time with their friends. They don’t think to improve as a players and as a team in every training, it appears this is the coaches problem. Many of them are parents that find the players enjoyment to be more important, not the learning sense. Of course for us it’s really important that the players enjoy in the sessions, but they have to enjoy learning about the game with the games the coaches purpose. Our thinking is to help the players to develop their qualities within the trainings and out of it, as a player but as a person first. We understand the youth football as a person formation to develop useful skills for their life, trying to instil our passion for the game and the attitude to fight for your dreams and improve every day. The training mentality is to play all versus all running behind the ball without thinking anything more. I was surprised because I used small sided games (2v2/3v3…) as a real match in a diferent pitch size and they don’t understand this game as a match. We are trying to explain to the players that by using these types of games they can reproduce a similar competition game in unreal spaces, but they are going to touch the ball more which will allow them to improve as players. To review what I have seen in trainings, players don’t show passion and attitude for the game, and the tactical content is not introduced in the majority of the sessions. These things are some of what make the process harder, the process to understand the game. In order to create smart players, they must make mistakes within the sessions, they have to experience different game situations that they can find in the competition. Trying to reproduce the competition in the training where the players have to use the brain to beat opposite team. Related with the previous problem, they don’t have collective sense, team sense, because they play as an individuals inside the squad. If you think as an individual you just want to run closer to the goal to score but will never think as a team, and with this mentality it’s imposible to develop the cognitive element. For this reason there’s a lot of transitions in the games that I watch in Ireland and this seems to be the same in the national teams. The coaches want the ball far from their goal and if the striker is lucky he will get options to score. If not, the other team will try to clear again, for this reason it is rare that any team will control the game. What’s the problem if there’s a lot of transitions? The problem is that the players lose their positions and nobody is organized. Everybody want a to run with ball and they don’t think where the defenders are, where their mates are, and where is the best space to play. The collective options disappear. For the last part in this point I want to talk about the biggest surprise that I received. When I came to Ireland I imagined strong players with really good physical qualities, showing agressivity to the ball, but they do not! They aren’t agressive to the ball, it’s hard to see two players fighting powerful for the ball. I think they have really good physical qualities which they have to transfer to the game and be agressive to compete every ball, after that start to introduce technical and tactical elements to become better players.